These are always a big hit wherever I take them, and they are so easy to make. The picture is of fancy Christmas pretzels which for some reason are cheaper than the ordinary ones, but any salted pretzel works well. All you need are pretzels and some chocolate caramels. I usually use Rolos or Galaxy Bites. 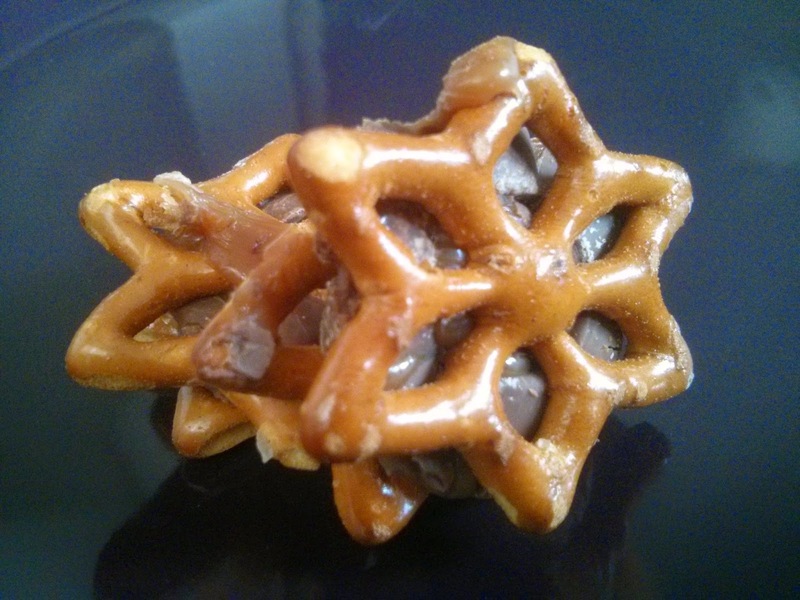 The Galaxy Bites have the advantage of a higher caramel to chocolate ratio, and often they are cheaper by weight, but they do roll around if you aren't careful, so you need some balancing skills to get them on to the pretzels and into the oven. If you do a whole baking sheet of these (and I recommend you do) you're going to need about four rolls of Rolos. Lay your pretzels on a lined baking sheet and put one chocolate caramel on top of each one. Put them into the oven for 3-5 mins at 180 degrees or until the caramels are soft. Press another pretzel on to the top of each caramel. You should have a sandwich of pure joy. They can take a while to harden. As I'm usually preparing these about 15mins before I leave to go to book club, I put them into the freezer for 10 minutes. Once they are hard they slide off the baking paper no problem.